Overload Option #3 | Ice Hockey Systems Inc.
Another option in the overload power play is the "pick". When F2 gets the puck, they carry it behind the net. F3 needs to position themselves between X2 and the net. Their goal is to open up a passing lane across the goalie crease for F2 to pass to F1. They also make it difficult for X2 to challenge F2 as they come out from behind the net. Usually F1 is able to sneak in behind X1 as they watch the puck. 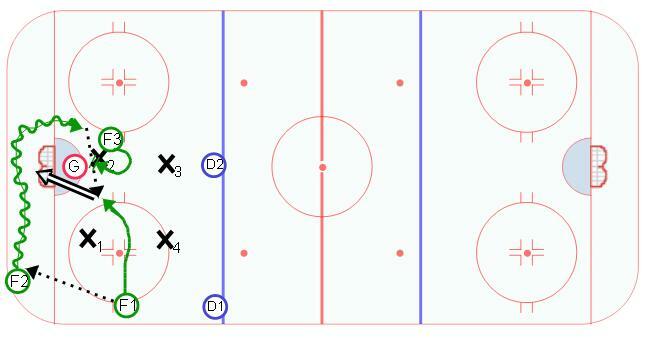 However, if X1 takes away the pass to F1, then F2 keeps the puck and shoots.